A typical banded iron formation consists of repeated, thin layers (a few millimeters to a few centimeters in thickness) of silver to black iron oxides, either magnetite (Fe3O4) or hematite (Fe2O3), alternating with bands of iron-poor shales and cherts, often red in color, of similar thickness, and containing microbands (sub-millimeter) of iron oxides. Some of the oldest known rock formations (having formed ca. 3,700 million years ago), are associated with banded iron formations. Banded iron formations account for more than 60% of global iron reserves, and can be found in Australia, Brazil, Canada, India, Russia, South Africa, Ukraine, and the United States. The formations are abundant around the time of the great oxygenation event, 2,400 million years ago (mya or Ma), and become less common after 1,800 mya with evidence pointing to intermittent low levels of free atmospheric oxygen. 750 million years ago new banded iron formations formed that may be associated with the theoretical Snowball Earth. The conventional hypothesis is that the banded iron layers were formed in sea water as the result of oxygen released by photosynthetic cyanobacteria. The oxygen then combined with dissolved iron in Earth's oceans to form insoluble iron oxides, which precipitated out, forming a thin layer on the ocean floor, which may have been anoxic mud (forming shale and chert). Each band is similar to a varve, to the extent that the banding is assumed to result from cyclic variations in available oxygen. It is unclear whether these banded ironstone formations were seasonal, followed some feedback oscillation in the ocean's complex system or followed some other cycle. It is assumed that initially the Earth started with vast amounts of iron and nickel dissolved in the world's acidic seas. As photosynthetic organisms generated oxygen, the available iron in the Earth's oceans precipitated out as iron oxides. At a suspected tipping point where the oceans became permanently oxygenated, small variations in oxygen production produced periods of free oxygen in the surface waters, alternating with periods of iron oxide deposition. BIFs occur in two forms, Algoma and Superior-type. Algoma-type are generally smaller in size and formed primarily in the Archean. Algoma-type BIFs are generally found in volcanic rocks in greenstone belts. The formation process involves the chemical precipitation of iron in anoxic environments. When oxidized the iron would precipitate and sink to the bottom of the seafloor. As the oxygen levels continuously shift, we can see magnetite beds interlayered with amorphous/microcrystalline quartz (i.e. jasper). Superior type are the second and larger form of BIFs. They primarily formed during the Paleoproterozoic era, occurring on continental shelves and can be found around the world. Superior types were formed by chemical precipitation in shallow waters, primarily due to the low atmospheric and ocean oxygen levels, resulting in high iron levels in the oceans. Under calm shallow conditions, oxygen released during photosynthesis by blue-green algae, would combine with the iron creating magnetite, which would then sink and deposit on the floor. Until 1992 it was assumed that the rare, later (younger) banded iron deposits represented unusual conditions where oxygen was depleted locally. Iron-rich waters would then form in isolation and subsequently come into contact with oxygenated water. The Snowball Earth hypothesis provided an alternative explanation for these younger deposits. In a Snowball Earth state the continents, and possibly seas at low latitudes, were subject to a severe ice age circa 750 to 580 million years ago (mya) that nearly or totally depleted free oxygen. Dissolved iron then accumulated in the oxygen-poor oceans (possibly from seafloor hydrothermal vents). Following the thawing of the Earth, the seas became oxygenated once more causing the precipitation of the iron. An alternative mechanism for banded iron formations in the Snowball Earth era suggests the iron was deposited from metal-rich brines in the vicinity of hydrothermally active rift zones. Alternatively, some geochemists suggest that banded iron formations could form by direct oxidation of iron by microbial anoxygenic phototrophs. Banded iron formations in northern Minnesota were found directly underneath a thick layer of ejecta from the Sudbury Basin impact. At the time of formation Earth had a single supercontinent called Columbia with substantial continental shelves. An asteroid (estimated at 10 km across) slammed into waters about 1,000 m deep some 1.85 billion years ago. Computer models suggest that the tsunami would have been at least 1,000 metres high at the centre, and 100 metres high about 3,000 kilometres away. Those immense waves and large underwater landslides triggered by the impact stirred the ocean, bringing oxygenated waters from the surface down to the ocean floor. 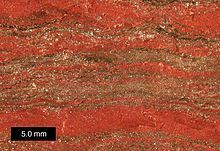 Sediments deposited on the seafloor before the impact, including banded iron formations, contained little if any oxidized iron (Fe(III)), but were high in reduced iron (Fe(II)). This Fe(III) to Fe(II) ratio suggests that most parts of the ocean were relatively devoid of oxygen. Marine sediments deposited after the impact included substantial amounts of Fe(III) but very little Fe(II). This suggests that sizeable amounts of dissolved oxygen were available to form sediments rich in Fe(III). Following the impact dissolved iron was mixed into the deepest parts of the ocean. This would have choked off most of the supply of Fe(II) to shallower waters where banded iron formations typically accumulated. The geological record suggests that environmental changes were happening in oceans worldwide even before the Sudbury impact. The role of the Sudbury Basin impact in temporarily shutting down banded iron formation accumulation is not fully understood. ^ Katsuta N, Shimizu I, Helmstaedt H, Takano M, Kawakami S, Kumazawa M (June 2012). "Major element distribution in Archean banded iron formation (BIF): influence of metamorphic differentiation". Journal of Metamorphic Geology. 30 (5): 457–472. Bibcode:2012JMetG..30..457K. doi:10.1111/j.1525-1314.2012.00975.x. ^ Rosing MT, Rose NM, Bridgwater D, Thomsen HS (January 1996). "Earliest part of Earth's stratigraphic record: A reappraisal of the> 3.7 Ga Isua (Greenland) supracrustal sequence". Geology. 24 (1): 43–6. doi:10.1130/0091-7613(1996)024<0043:EPOESS>2.3.CO;2. ^ a b c d Nadoll P, Angerer T, Mauk JL, French D, Walshe J (2014). "The chemistry of hydrothermal magnetite: A review". Ore Geology Reviews. 61: 1–32. doi:10.1016/j.oregeorev.2013.12.013. ^ a b c d Zhu XQ, Tang HS, Sun XH (2014). "Genesis of banded iron formations: A series of experimental simulations". Ore Geology Reviews. 63: 465–469. doi:10.1016/j.oregeorev.2014.03.009. ^ Cloud P (1973). "Paleoecological Significance of the Banded Iron-Formation". Economic Geology. 68 (7): 1135–1143. doi:10.2113/gsecongeo.68.7.1135. ^ a b Slack JF, Cannon WF (2009). "Extraterrestrial demise of banded iron formations 1.85 billion years ago". Geology. 37 (11): 1011–1014. Bibcode:2009Geo....37.1011S. doi:10.1130/G30259A.1. ^ Lyons TW, Reinhard CT (September 2009). "Early Earth: Oxygen for heavy-metal fans". Nature. 461 (7261): 179–81. Bibcode:2009Natur.461..179L. doi:10.1038/461179a. PMID 19741692. ^ Hoffman PF, Kaufman AJ, Halverson GP, Schrag DP (August 1998). "A neoproterozoic snowball earth" (PDF). Science. 281 (5381): 1342–6. Bibcode:1998Sci...281.1342H. doi:10.1126/science.281.5381.1342. PMID 9721097. ^ Margulis L, Sagan D (August 2000). What is Life?. University of California Press. pp. 81–83. ISBN 978-0-520-22021-8. ^ Emiliani C (1992). Planet Earth: Cosmology, Geology, and the Evolution of Life and Environment (1st ed.). Cambridge University Press. pp. 407–. Bibcode:1992pecg.book.....E. ISBN 978-0-521-40949-0. ^ van Andel T (1994). New Views on an Old Planet (2nd ed.). Cambridge University Press. pp. 303–05. ISBN 978-0-521-44755-3. ^ a b c Li LX, Li HM, Xu YX, Chen J, Yao T, Zhang LF, Yang XQ, Liu MJ (2015). "Zircon growth and ages of migmatites in the Algoma-type BIF-hosted iron deposits in Qianxi Group from eastern Hebei Province, China: Timing of BIF deposition and anatexis". Journal of Asian Earth Sciences. 113: 1017–1034. Bibcode:2015JAESc.113.1017L. doi:10.1016/j.jseaes.2015.02.007. ^ "Banded iron formations facts, information, pictures". Encyclopedia.com. Retrieved 2018-02-22. ^ Kirschvink J (1992). "Late Proterozoic low-latitude global glaciation: the Snowball Earth". In Schopf JW, Klein C. The Proterozoic Biosphere: A Multidisciplinary Study. Cambridge University Press. ^ Eyles N, Januszczak N (2004). "Zipper-rift': A tectonic model for Neoproterozoic glaciations during the breakup of Rodinia after 750 Ma" (PDF). Earth-Science Reviews. 65 (1–2): 1–73. Bibcode:2004ESRv...65....1E. doi:10.1016/S0012-8252(03)00080-1. Archived from the original (PDF) on 28 November 2007. ^ Kappler A, Pasquero C, Konhauser KO, Newman DK (November 2005). "Deposition of banded iron formations by anoxygenic phototrophic Fe (II)-oxidizing bacteria" (PDF). Geology. 33 (11): 865–8. Bibcode:2005Geo....33..865K. doi:10.1130/G21658.1. Archived from the original (PDF) on 16 December 2008. Harnmeijer JP (2003). "Banded Iron Formation: A Continuing Enigma of Geology". University of Washington: 1–24. Klein C (October 2005). "Some Precambrian banded iron-formations (BIFs) from around the world: Their age, geologic setting, mineralogy, metamorphism, geochemistry, and origins". American Mineralogist. 90 (10): 1473–99. Bibcode:2005AmMin..90.1473K. doi:10.2138/am.2005.1871. Bekker A, Slack JF, Planavsky N, Krapez B, Hofmann A, Konhauser KO, Rouxel OJ (May 2010). "Iron formation: the sedimentary product of a complex interplay among mantle, tectonic, oceanic, and biospheric processes" (PDF). Economic Geology. 105 (3): 467–508. CiteSeerX 10.1.1.717.4846. doi:10.2113/gsecongeo.105.3.467. "Jaspilite" . Encyclopedia Americana. 1920.